When recently in Europe my gardening friend took me to one of her magical walking places - le Chateau de la Hulpe, in Brussels. We sauntered around in the gentle rain, on paths flanked by forests of flowering rhododendrons. Where are my words (which usually flow over-freely in my journal pages) to capture this beautiful place? 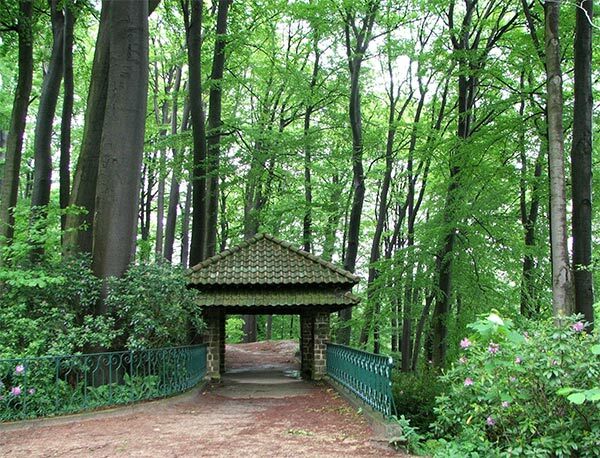 It's so difficult for a southern (that's hemisphere) visitor to describe the feeling of the Belgium woods and forest. There is much more lightness of green, and the trees are much more open to the sky, than in the beech forests and New Zealand bush back home. 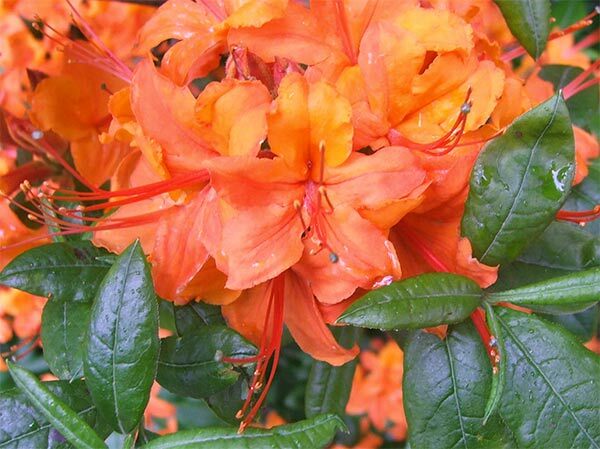 On a drizzling pre-summer's day in May, the late flowering lavender rhododendron trees were in furious flower, while the deciduous Azaleas were almost finished. Our path looped around the lake, misty green with reflections of long grass and trees. The Chateau itself, some walls smothered in ivy, looked quite lonely in the drizzle. Garden Bench - Facing the Wrong Way! 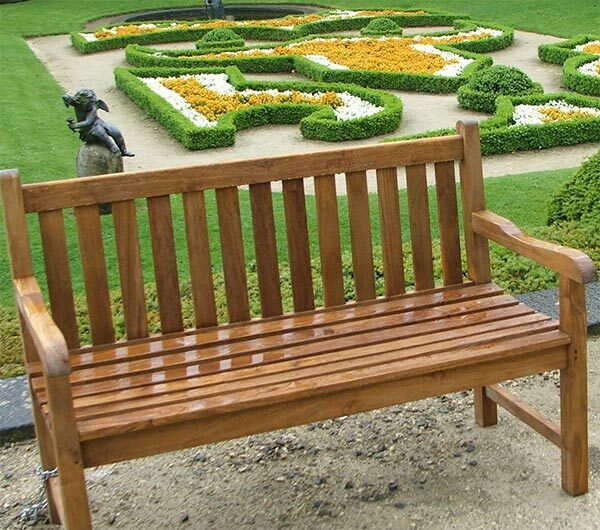 There were clipped arches of darker greenery surrounding a parterre planted in cream and orange pansies, complete with viewing seat - oddly (for a gardener) pointing the wrong way! 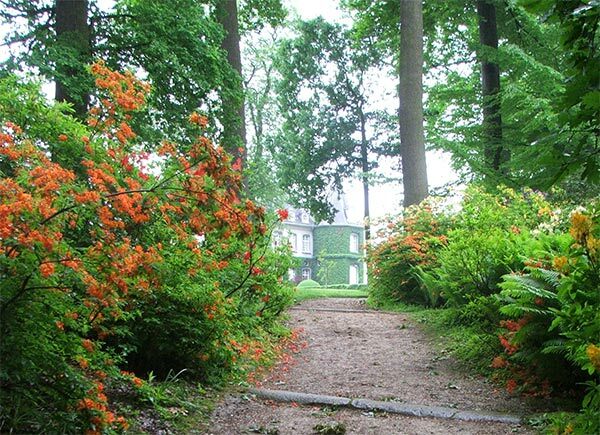 Le Chateau de la Hulpe is one of my friend's favourite walks, and her beautiful photographs are sprinkled through the Moosey Forum. As for my visit, best to let my camera try and do the talking! The La Hulpe Chateau was built in 1842, and overlooks nearly 220 hectares of woods and ponds on the edge of the nearby Soignes forest. The old Solvay field is a splendid extension of the forest and has some remarkable trees. It is a beautiful place for walking and relaxation, not to be missed. 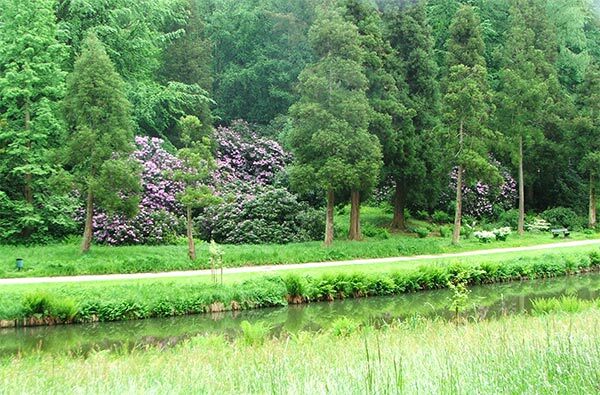 Massive trees of rhododendrons and azaleas surround the castle, which is not generally open to the public. That's no problem - the grounds are wonderful enough on their own to walk slowly around.